(PHOENIX, AZ May 2014) – U.S. Congresswoman Kyrsten Sinema, representing Arizona’s 9th District, recently visited The Art Institute of Phoenix. During her visit, Sinema toured the school with campus president Chad Williams, Dean of Academic Affairs Dr. Meryl Epstein, Dean of Student Affairs Tanisha Washington and Director of Student Financial Services Abigail Garcia. 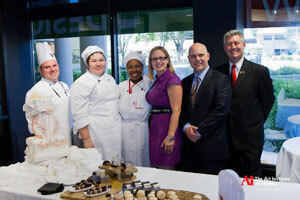 She had an opportunity to interact with students from a variety of programs, and her visit was capped off with a tasting prepared by award winning pastry chef and culinary instructor, Chris Cwierz. The Art Institute of Phoenix is one of The Art Institutes, a system of over 50 schools throughout North America. Programs, credential levels, technology, and scheduling options are subject to change. Several institutions included in The Art Institutes system are campuses of South University or Argosy University. The Art Institute of Phoenix, 2233 West Dunlap Avenue, Phoenix, AZ 85021. ©2014 The Art Institutes International LLC.